Third Cross-Strait Youth Maker Competition requires competitors to design and make products with social and commercial value within 48 hours. 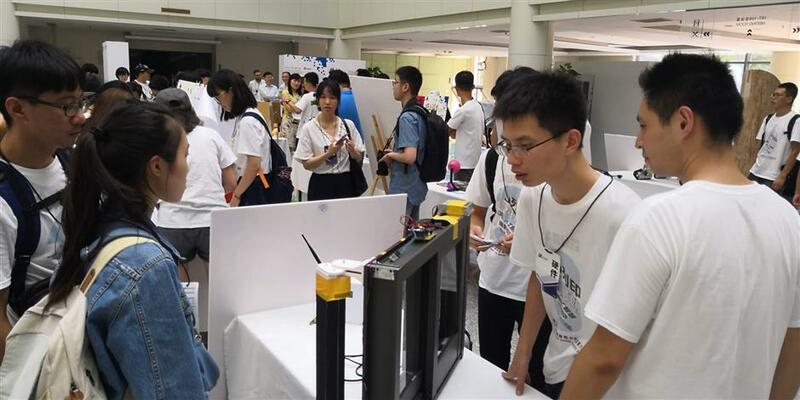 Five students from Chiayi University in Taiwan won the top prize in this year's Cross-Strait Youth Maker Competition Wednesday. They won the award and 10,000 yuan for a system that monitors harmful gases, such as carbon monoxide, in the home, and alerts householders via their smartphone when danger threatens. It can also open windows and start fans to extract the polluted air. “The system gives residents or authorities time to take action and avoid casualties,” said maker Chen Yi-Yi. The competition, with sections for adults and teenagers, requires competitors to design and make products with social and commercial value, and sustainable development plans within 48 hours. Besides the top winners, other adult competitors showed their creativity through a pyramid coffee cup that prevents liquid from splashing out and musical instruments made of paper with ultrasonic sensors to detect position of the hand. The two winners in the teenage group presented a tennis practice system and a system that can deliver packages under elevated roads. The competition, the third organized by Shanghai's Taiwan Affairs Office, Tongji University and others, attracted more than 210 students from Taiwan and the mainland. “The event has become an influential platform for young people from Taiwan and the mainland to communicate and develop creative ideas,” said Zhang Zhijun, president of the mainland-based Association for Relations Across the Taiwan Strait.